He welcomed the Afghan government’s proposal last year for unconditional peace talks with the Taliban, saying this offers a glimmer of hope for peace. 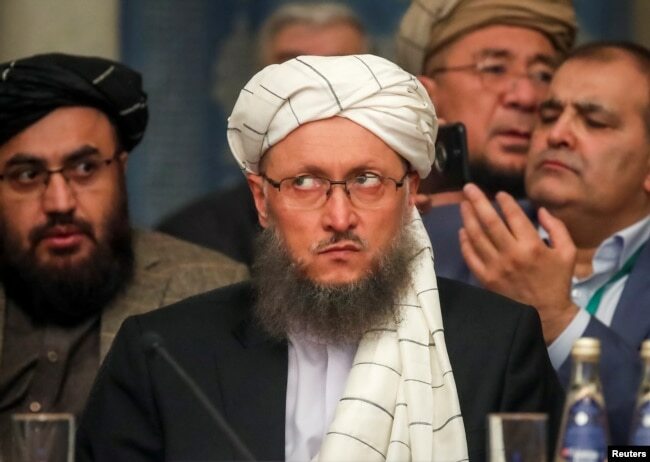 FILE – Deputy Head of Political Office of the Taliban Abdul Salam Hanafi attends a conference arranged by the Afghan diaspora in Moscow, Russia, Feb. 5, 2019. Gilmour made no mention of the claim. Instead, he weighed in on the importance of the talks to ensure human rights gains made by Afghans. He said no compromises must be made on issues of equality, non-discrimination, women’s rights and the criminalization of torture. Afghan first secretary and Charge d’affairs Hamid Formuli said his country is committed to upholding and protecting women’s rights. In response to criticism from Gilmour, he said the Afghan government has undertaken measures to prevent and combat violence against women.